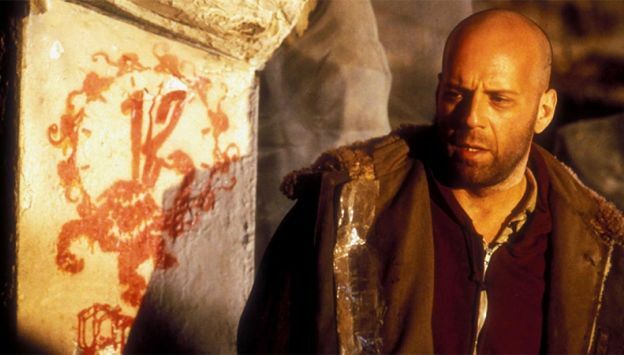 In the year 2035, convict James Cole (Bruce Willis) volunteers reluctantly to be sent back in time by scientists to discover the origin of a deadly virus that wiped out nearly all of the earth's population decades earlier. But when Cole is sent mistakenly to 1990 instead of 1996, he's arrested and locked up in a mental hospital, where he meets a psychiatrist (Madeleine Stowe) and the son (Brad Pitt) of a famous virus expert (Christopher Plummer). With mind-blowing plot twists, and an all-star cast, 12 MONKEYS is a kooky effective experience and one of the best-looking sci-fi films of the modern era.